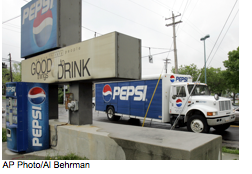 Some interesting insights from PepsiCo. CEO Indra Nooyi on what she believes are the central challenges facing capitalist enterprises in general and her company in particular as a result of the economic downturn. In this brief interview with the BBC, Nooyi laid out her claims that "you can't separate banks and reform of the banking sector … from the rest of the corporate world." The reason? Wall Street and Main Street are "all interconnected." Therefore, says Nooyi, "the debate right now is how do you change capitalism in total so that the emphasis is not just on the shareholder but on the stakeholder; the emphasis is not just on what happens within the company, but what happens sustainably, long-term, taking all of society into consideration." You heard it here first, folks: the CEO of a major corporation believes that the capitalist system needs to be reformed so that—gasp!—corporations look out for the good of society as a whole rather than just at their own bottom lines. The result, she says, is that companies will once again emerge as a entities that can be trusted. Now where have I heard similar sentiment recently? On Pepsi's business in particular, meanwhile, Nooyi is equally enlightening: she points to shifts in pack sizes for soda and a stronger focus on emerging markets in the Middle East and Latin America as ways in which her company is dealing with the impact of the recession. Not a bad amount of information for a minute forty-five of interview, really. Finding a Job is Getting Easier. Really.